UAH prelim – January temp may be below normal globally | Watts Up With That? So far, much of January (red) has been below the average line (orange) for the data set since 2002. It is not in record territory yet for this dataset but with 1/4 degree. My SWAG for the January average UAH value is -0.12°C. We’ll know in a few days when Dr. Spencer posts. January 2008 was even cooler than what January 2011 is shaping up to be, by the way, so it’s not a particularly extraordinary result in my opinion. It’s true that it will contribute lowering the mid-term trend, though. Well the oceans are cooling so a fall in GAT is to be expected. The UAH figures do not agree with NASA but I am not surprised. An unbelievable amount of water vapour was generated so far this winter by the ocean heat in the Arctic. Which means a great deal of solar reflection has occurred. Looks like a great deal of rain this summer and cooler temperatures again. Heard through the grape vine that Lisbon is going well! An exceptionally cold year in comparison to model predictions, say the coldest year since Pinatubo, would really bring the debate into the open. They would try, of course, but it would be very difficult to explain it away while maintaining an alarmist pose. Its really interesting considering that this La-Nina is not a record setter, and the Atlantic is still considerably warm. It must be the PDO negative phase in conjunction with the a continued moderate decrease in TSI. How much water vapour can be generated with an air temperature of ~ -20°C and a water temperature of -4°C ? I do not know the energy of sublimation for salt water but am aware that some energy from the sun may be lost by Bragg reflection. What are your thoughts? couple of volcanos may drop it further? Let me protest – feebly – that my distaste in the “2010 will be the warmest year ever” stories back in October is somewhat shared in this “January temp may be below normal globally” story. OTOH, in the former case, the authors may have figured they better make hay while the La Niña temps hadn’t set in and did so 9/12th of the way into the year, whereas we’re expecting little change in UAH readings and are 27/31st of the way through the month. 0.75 vs 0.87. So, let’s take this as notice that Puxsatawny Phil will have some scientific competition for the news in a few days. Time to sketch out a letter to the editor of your local newspaper. I remember something equally strange in Jan (feb?) 2008. It was the coldest Jan in 14 years – and I began to wonder whether somehow the “warmer” readings could be brought forward a month leaving the cooler ones to the next month: so in attempting to make 2007 exceptionally warm, they had to make Jan 2008 particularly cold. I’m not clear what the mechanism might be – perhaps there’s some kind of calibration regime (on reflection seems unlikely) and they purposely picked the colder ones to calibrate Dec in preference to warmer ones which then got calibrated in Jan.
Then we see the same thing again in Jan 2010 … there’s no doubt there was the incentive to make the first decade of the 21st century have a warming trend! Especially note not only the wider spread of cold water in the Pacific but also how cold the Gulf of Mexico and Atlantic is, including the cold SST that have caused the rains in Brazil. Look at the _cold_ ‘Gulf Stream’ (North Atlantic Drift) is that going to be keeping Europe warm? a 30 year baseline is just a convention based on a classical understanding of climate.. When there are observed 60 years cycles in the climate. at some point the average is at the top of a cycle, bottom, or a rising or falling trend.. thus creating anomalies that mean potentially nothing..
A 60 year base line or a hundred would be better, but still not ideal. Where did all the energy from last year go? It had to have been trapped in the troposphere, but is it missing? Others and myself who have followed the UAH daily plotter (for channel 5) have noticed that the average of the daily anomalies does not equal what Dr. Spencer reports for the monthly figure. The last time I did the math, the November average of daily anomalies was noticeably lower than Dr. Spencer report for November. I have not seen an explanation why. See http://troyca.wordpress.com/2010/12/03/aqua-ch5-daily-vs-uah-monthly/ for a graph of how the two correspond to one another. Anthony, I don,t know if you’ve caught this but if you haven’t it’s up there for the friday funny! Enjoy! Whatever the temperature does, warm, cold, rising , sinking, the only explanation will be climate change. The politicians will say: The climate change discussion isn’t the subject anymore, we are more interested in the energy discussion. That’s why we have agreed to reduce the CO2 emissions by 20% and that’s why we support clean energies like bio-fuels, wind and solar because we want to promote energy independence form foreign imports. That is our view, discussion closed. You can’t win this war, without kicking some people very hard where it hurts most. It is with dismay that we bring you sad news from one of Britain’s most self-righteous boroughs. In Islington, the location for the Private Eye comic strip “It’s Grim Up North London”, the area’s ‘Carbon Rationing Action Group’ has decided to call it a day. Group members will no longer measure everything they do and exchange the vital information. “After four years, three complete accounting years, the Islington and Hackney CRAG [Carbon Rationing Action Group] is no longer settling (ie, buying and selling carbon every six months, anymore),” writes John Ackers, a “CRAG-er”. That old enemy of sustainability – couldntgiveafuckability – has dealt the movement a setback. “Four of us wanted to keep going, but two dropped out and two weren’t very good at doing the data-gathering,” Ackers explains. CRAGS are a “growing network of carbon conscious citizens”, according to the movement’s website. The Islington Craggers – all eight of them – had adopted a personal carbon trading. This combines two ideas: rationing, and a virtual currency that allows participants to exchange credits. And there was also perhaps the faintest glimmer of a realisation that the exercise was, on balance, an epic waste of time. And passim. I promise you, it is no joke, however ironicaly reported. Life of Brian or what? And the coup de grace is actually the perfect quote from T.S.Eliot at the top of the article. If you knew Islington, you’d understand but let us say, Greenwich Village has nothing on it! Hope not to OTT and OT? Totally off topic, but the Telegraph is reporting today Himalayan Glaciers are actually growing. Can’t wait to hear how this is really a hidden sign of AGW! 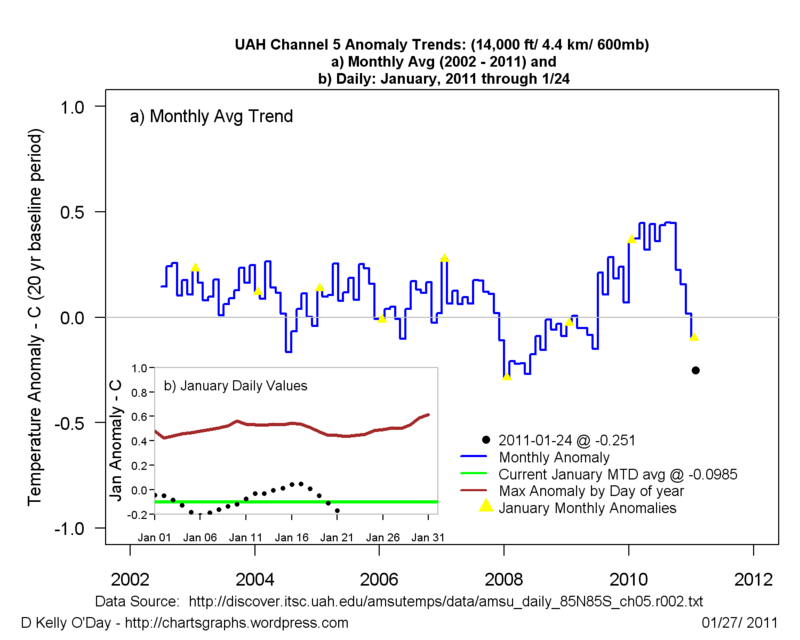 My prediction for the UAH January 2011 anomaly is +0.06 deg C, obtained from Channel 5 by a comparison with January 2010. Won’t the warmists pass this temperature decline as a great success of limiting carbon emissions? Here in Minnesota, a 2C increase in a century is too little too late. We need 20C tomorrrow! This sort of thing is embarassing to the warmists, more than they can adjust or explain away. All we need now is another whistleblower to leak a few more emails and the house of cards will fall flat. The radical shift in temperature anomaly points to the issue of temperature measurement. It would be a violation of Physical laws for that much heat to be radiated into space that quickly without a massive change in Global temperature; therefore, either the heat must be going somewhere, or, the temperature measurements do no represent the Global temperature!! Where could the heat be going?? It must either radiate into space, or it must go into the oceans. The La Nina shows that the heat is going into the oceans; whereas, the El Nino shows that heat is coming from the oceans. If we could get a “read” on Global ocean surface temperature (0-100 foot depth), we could determine how much heat is going into the oceans. I don’t know of any analysis available. My thoughts are that the oceans can not absorb heat that fast; therefore, the sudden change in temperature anomaly is due to the inability to correctly measure the Earth’s Global Temperature. In my opinion it is an extraordinary result when you consider that there have been 30+ years since the start of the recent warming trend, yet the average monthly temperature can fall to below the average on multiple occasions. This signals that the warming is not significant because it is less than the variability. if i am not mistaken, Dr. Spencer encourages us to look at channel 5 as the closest representation of the global temperature, but his actual algorithm is more complicated than that. so i think channel 5 is a “rule of thumb”….but i could be confused. i am answering the poster above who said that taking the average of channel 5 daily is lower than the number Dr. Spencer actually puts out. That one should be engraved on the tombstone of every socialist who ever lived. I noticed that channel 5 temperature dropped during a single week in November from about where it had been for the past year to about the long term average … and has stayed there since. And today’s sunspot number is …. zero. Does anyone know how frequent it is to get a spotless day this far into the cycle? ” Surface temperature anomalies for the period 17 December 2010 to 15 January 2011 show impressive warmth across the Canadian Arctic…. What data are being presented here? If the anomaly comparison is truly against the 2002-present average, the result is not impressive. Given that the 2000s was the hottest decade on record, yada, yada, yada, being below that average is ho-hum. It certainly isnt below ‘normal’. The orange ‘average’ line on the temp chart is not defined on the tracking page. Elsewhere, Spencer indicates that it is the 1979-1998 average (of what?). Given the apparent step change in global temp @ 1998, being below the 80s-90s average would be more interesting. Well UAH and GISS (NASA) don’t even measure the same things do they; so why would we expect them to be the same ? GISS reads the Temperature (anomalies) inside chain link fence enclosed areas out in parking lots. I guess they fence them in to stop the Weber grills from taking refuge under the owl box. Does UAH CH-5 read the 14,000 ft Temps or am I confusing this with something else. I’m sure they don’t read the SSTs at 14,000 ft, so maybe its the Temp anomaly. The graph shown above does show some pretty wild swings for the last few years; but do we know how rare such unprecedented crash dives are. I guess the year is off to another interesting start; but it looks like the sea ice will peak at a lowish level compared to other recent years; well it’s just weather; the people back east know that and expect to be back in steam conditions before too long. If the anomaly comparison is truly against the 2002-present average, the result is not impressive. The difference between temperatures now and temperatures one year ago (red line vs. light blue line) is quite impressive. More so when you consider that the drop occurred in a single week and has stayed there. Anthony – just remembered what happened the last time we had a dramatic fall in temperature like this in Jan 2008. The CRU data came out around the 20th of the (following) month. I knew something was in the air and I was keenly looking forward to the result so I could post off a few letters to the newspapers. So, imagine my disgust when the week before we had never ending news coverage with the papers full of global warming nutter propaganda (with the biased BBC leading the charge). So, by the time the CRU temperature came out the media had spent so much time telling the world we were going to cook to death – that you can imagine how successful I was getting any letters published regarding the 14year low. UAH doesn’t water board its data like NASA does. Well Dr Lurz, just how fast would you like the oceans to absorb heat? Is about 2.249 x 10^8 m/s fast enough for you ? That’s roughly the velocity of light in sea water; which is how fast incoming solar energy is deposited deep in the ocean. It takes about 2.223 microseconds, for the last vestiges of that energy to penetrate to 500 metres depth (99%). Heat storage in the ocean is virtually instantaneous. It is the return of that energy to the weather/climate region nearer the surface, that takes time to happen. The heating of those deeper water (during daylight) should set up vertical convection currents , that will bring some of that energy back to the surface; and of course the competing conduction processes, will take some of it even deeper; but only under a rather low driving Temperature gradient. Keep in mind that I posted that before this most recent baseline change, which lowers the UAH anamoly by about 0.1 C. It’s still not an exact match, but the reported UAH anomaly on average is only about 0.08 C higher than the AMSU average of daily anomalies now, rather than 0.18 C.
The Earth’s thermometer must be broken! (By the way, the CAGW crowd shouldn’t worry if the mean temperature drops back to normal or below normal – the scientists at NASA and NOAA will continue their efforts to make the past cooler so as to keep their GCM hindcasts accurate. Because we all know that the past cooler than you remember). Claude Harvey, you noticed – today is either a laugh out loud or a couldntgivea[snip]ability day! Read the article, though, it’s one of the funniest I’ve ever read! Well there’s not enough information in your post to guess at what you are referring to. But last time I checked “Bragg” reflection, is something that happens in crystalline structures. For example VCSELs (Vertical Cavity Surface Emitting Lasers) are able to function because underlying the active lasing gain layer, there is a “Bragg Mirror”, made from multiple crystalline layers; it is related to diffraction from ordered structures, such as first used in X-Ray studies. But the reflectance of sea water or any water, is normally referred to as “Fresnel Reflection”, which is the result of a set of equations that can be derived directly from Maxwells Equations of Electromagnetic Radiation. Those equations explain why in general the reflected (and transmitted) light from an optical surface (including water) is partially plane polarized; or in the case of the Brewster Angle Incidence, the reflected light is completely plane polarized. (Brewster angle is arctan (N) where N is the refractive index; actually the ratio of the indices for the two materials (>1.0)). The reflectance at a media boundary, like air/water, or air/glass is very much the same as the reflections that result in a transmission line (co-ax cable), when there are impedance discontinuities. The Transmitted beam is never completely polarized under any condition; because the Reflected components are only of the order of 2-3% of the total. So water is only weakly reflecting; so 975 or so of the incident energy is transmitted, and if the water is deep enough is completely absorbed eventually; but mabe only after 100-500 metres or so. So for all practiuical circumstances, deep ocean water is pretty much a Black body absorber; or at least a gray body with an emissivity of about 0.97. Sans the blue Raleigh scattering in the atmosphere, earth would be known as the “Black Planet” rather than the “Blue Planet”. From my previous post (Please use Frankenstein’s Monster’s dialect): Warm good, Cold bad. if projected -0.12 anomaly holds until the end of months, that would be slightly bellow the old (1979-99) average as well. If temps can vary by 0.5 degrees in a six month period than how can we possibly claim that the average has risen 0.7 degrees in the last century and be alarmed about it? I started looking into the impacts of warmer waters on fish in the Eastern North Atlantic and came across this recent study- which seemed to show that species richness increased with warmer temps. The authors also noted a number of other studies which showed the same thing for butterflies, plants, freshwater and marine fish, etc. In one area, the West of Scotland, the authors found a decrease in the number of boreal (cold water) fish, but they also found a positive correlation to fishing practices here as well as warmer temps, so kindof hard to tease apart I guess. Haven’t looked at those other studies yet, but the message again seemed to be a net gain for biology in a warmer world. I guess that should be a good thing. ? Anyone like to throw some cold water on this conclusion? To be fair, the conclusion of the paper only relates to catastrophically cold times, not incrementally cold or incrementally warm. The fact that flora seems to be moving downslope (recent article) seems like the terrestrial life can migrate to what suits them. For there to be mass marine extinctions, it must have been really bad times, in which the fish could not get away—like a snowball earth. If you look at history, times of cooling was when we have had periods of upheaval in human history. Cool periods are when Rome was sacked, the Huns were invading, the Goths were invading, plagues were on the march and certain regents were losing their heads. Colder periods of climate are very hot periods of history. I don’t like “interesting times”. Not “below normal”; rather “below average for the satellite record”. Not really. Similar rises/drops in a monthly temp anomaly (~0.4C) from one year to the next have happened 40+ times in the 30 years of UAH data. Global temp data have high variability. Check out the swing from Jan 2007-Jan 2008 (0.71C) or from Apr-97-Apr98-Apr99 (+0.97C, -0.69C). Temp rose quickly from Jan 2009 to Jan 2010, and dropped slightly less quickly (but still quite fast) from Jan 2010 to the present. Quick rises and falls are typical of El Nino year swings. No it didnt. The drop from Jan 2010 to present occurred over the course of a year. There were four sizeable drops (Mar-Apr, May-June, Sept-Oct, Nov-Dec) that ate up the 0.55C anomaly of Jan 2010 and turned it into the present value, which looks like it is going to shake out around 0.1C give or take 0.05C. Dr. Lurtz says: The radical shift in temperature anomaly points to the issue of temperature measurement. It would be a violation of Physical laws for that much heat to be radiated into space that quickly without a massive change in Global temperature; therefore, either the heat must be going somewhere, or, the temperature measurements do no represent the Global temperature!! You’ve got it! THE basic problem, one that folks on all sides regularly ignore, is that a Global Average Temperature simply does not exist. It is at best a massive confusion and at worst a deception. The reasons for this are, unfortunately, founded in 2 rather arcane bits of understanding, so I suspect that just about everyone (including Ph.D. “Climate Scientists” at NASA) just ignore them rather than take the time to think about it. 1) You can not average an intensive property and have it mean anything. Temperature is an intensive property. 2) Temperatures are driven by processes, such as land form (mountains) that are fractal in nature. Every single ‘surface’ has it’s own temperature. I assert temperatures are fractal in that the size of a fractal varies with the size of ruler you use to measure it (and we are constantly changing our rulers / thermometers). Because of these two things, the idea of a Global Average Temperature is simply wrong. Note that this is different from measuring the infrared signature for an entire planet from a single view of the whole place. Then you have fixed your ‘ruler size’ at ‘one planet’ and so #2 drops out. Further, you are not averaging temperatures, you are counting total photons of IR. That count is then DEEMED to be the same as certain black body temperature, but it is not saying the surface IS that temperature (as it is not). It is a leap of assumption, then, to say that the “average of surface temperatures” would be the same as that hypothetical black body. So you can get an IR measurement from space that is useful; you just can’t say that is the average of surface temperatures (only that it is the same IR as a Black Body of a certain temp would have emitted). You can see this pretty clearly if you assume a BB of 100 pixels all at 100 K, then ask “What if I raised ONE to 200 K?”. You now get 2^4 more IR from that one pixel. But ((99*100)+(1*200))/100 will not give you the same ‘temperaure’ as that IR image… If we assume the IR count at 100 K is “1” for our counter, then we would have 16 + 99 = 115 IR Count and map that to 115 K; where the former temp average gave 101. So which is it, 101 K (average of temperatures) or 115 K (count of increased IR photons)? And yes, I ‘left out some bits’ in this example to make it more useful for illustration. The basic point is that IR rises as a 4th power of temp. But an average of temperatures flattens everything linearly. To assume the IR count is an average linear increase in temperatures requires that the IR be evenly distributed, but we know it is not. OK, a simple example. Two pots of water, one at 10 C the other at 20 C. Mix them. What is the final temperature? You can’t know. It depends on how big the pots were. Relative mass. We assume the masses being heated and cooled are constant and of the same average specific heat for the planet to change temperatures, but that isn’t true. Oceans overturn and different water comes to the surface. Snow falls in the mountains, now we’re not heating rocks with the sun but heating snow. If those pots of water were 0 C and 100 C the problem is much much worse. Is that 0 C water in the form of ICE or not? Is that 100 C water vapor, or not? Heat of fusion and heat of vaporization. No temperature change, lots of heat flow. So are we measuring, on average, the change of vaporization from the ocean? The change of condensation from the air? The rate of melting of snow and ice (that consumes heat) or the rate of snow fall (that liberates heat)? And in what masses? As a simple example, a acre of mountain desert drops from 1 C to 0 C. In the first case, it is just bare sand. It stays that way for one week. An “average of temperatures” would say nothing happened in days 2-6. Yet cold soaked into the sand to some depth. Some heat flowed. It was, in fact, constantly cooling (heat flowed out of the sand and into the air but the air did not warm, as the heat was leaving on to space, cooling). Now put 1 inch of snow on that ground. Still 0 C. Yet that snow has a much higher heat content than the inch of air it replaced. Have it snow each day. Now, each day, you have taken 1 inch of snow worth of ‘heat of fusion’ and dumped it to space. That is one heck of a lot more “cooling” than the dry example. Yet the thermometer says “nothing happened”… You did not account for mass and heat of fusion. OK, that’s the ‘nickle tour’ of intensive vs extensive variables and why you can’t average them and have any meaning left. The “fractals” one is a bit harder. (Please, don’t groan like that… I’ll try to make it easy). This is related to an interesting issue of measuring coastlines. If you measure the coastline for California from Mexico to Oregon by taking a speed boat straight up the line off shore, you get a short number. If you follow each in / out of every major bay, it’s a longer ride. Follow every little estuary in, even longer. Get down to measuring the distance around each grain of sand on the beach it becomes gigantic. About 1000 miles to 80,000 miles. Your choice. As you make the ruler shorter, you measure more curves on more things and get a longer total. For temperatures, we know that it varies down to the size of a single pebble. An IR image shows that. We assume that a white box about 3 feet off the ground sort of averages them all out to something usable. So far so good. We are fixing our ‘ruler’ size at whatever area of scope a single Stevenson Screen averages. BUT, then we scatter them all over the place with random distances between them and change the number of them by a factor of 10 (or more) over the period of time we are measuring. We are changing the area each of these is expected to measure, changing our ruler length. We have a very dynamic “rubber ruler” measuring a fractal surface. No wonder the numbers keep wandering around! And these properties are Not Negotiable. They are fundamental properties of nature. Yet all of “Climate Science” is predicated on strictly ignoring them and in fact on abusing them in ways that are non-physical. Where could the heat be going?? Must it? Was it ever there? Since our method of measuring in broken fundamentally, we don’t really know where the heat went, or if it was there to begin with. All we have are temperatures and IR counts. Those are NOT heat. IMHO, the heat leaves each day. We warm during the day, and cool at night. The net change in temperatures over the seasons are not “accumulating” heat, they are changes in heat applied as our axial tilt changes an wind blows in from somewhere else. There is no heat stored other than what gets trapped under a cloud layer waiting for the next cold clear night. Then it is gone. In this sentence we can see the impact of decades of “Climate Science” at work confounding things. I’m not picking on you, Dr. Lurtz, the same sentence will be made by millions of folks for the same reasons. Then we come back to “measure the Earth’s Gobal Temperature”. Yet there is no such thing to measure. It is a fantasy of arithmetic. And a broken one at that. We can measure the total IR Emissions from a point in space. But that is NOT the “Global Average Temperature”. We can measure a sample of temperatures on the surface, but averaging them has no meaning. None. Not a scrap. And then we desire to mix these broken things together into a conceptual model of how the earth is changing… and where the heat is “stored” and “going”. Every day you can see this same broken parade wandering down these same streets, again and again and again…. What we ought to do? Put a single satellite in orbit with the whole disk of the planet in view and just do a gross energy out measure. IR photons and visible. Have a similar count of solar flux. Compare the two over about 120 years. THEN we would have a clue how our energy balance shifts over time. But measuring airport tarmac today and comparing it to cow fields in 1850 with no attention to how many spots are measured, where they are, and how they changed, then averaging them; that has no relationship to heat flow at all, and precious little to reality in general. There are the Argo floats that measure ocean temperatures at different depths. Search this site and I think that you’ll find some data and sources for the data. Lengthy, but important and informative. We have a similar thing going on with our view of the sun. The AGW warm-earther mantra is, “sun not change much”. or “Me not see sun much change” (I’m using my sarcastic Bizarro voice). Sure, irradiance, “as measured by our current means” shows up and down variance of only 0.2% at a current latitude or inclination or altitude of measurement, and other variables. But that is one wavelength set, which was chosen to measure mostly visible light, because people see light. We measure what we choose to measure, and apprehend the result consistent with our comprehension (or maybe consistent with our “world view”). Assumptions are built into every metric. WUWT has been a very good graduate course for me in learning to sort variables, and learn which ones are key limiting variables, and which measurements are doomed to being swamped by “noise”, and therefore, of limited use. For those that have yet to read the posts in E.M.’s links, do so, insert and save. I really hated all of the articles declaring 2010 “the warmest year ever” before the year was out and all the data was in. Likewise I don’t care for this post when the month is not over and the data is not in. Is it so hard to wait 4-5 days for the entire data set to come in? No, what I find most interesting is how cool the Indian Ocean is. Generally in a La Nina condition the warm water is pushed West into the Western Pacific and Indian Ocean. The anomalies in the Indian Ocean are often warm during La Nina, they are currently cold. And the “Western Pacific Warm Pool” seems oddly cool for a La Nina, too. Superb post, E.M. Smith! It echos my opinion that the global average temperature as computed by NASA/NOAA is thermodynamically meaningless, and is really just an “index” (sort of like the Dow Jones Industrial Average relative to the stock market value as a whole). And statements such as “the earth’s temperature has warmed 1.4 F since the beginning of the industrial age” are equally meaningless. This is made all the more confusing by using “anomalies” based on a arbitrary 30 year period which are then averaged in an ad hoc manner. The best we can do, in my opinion, is to estimate climate change using individual local temperature and precipitation histories as a guide (no spatial averaging). Don’t you understand the earth can only support so many humans and other living creatures. Warmth and prosperity increases the number beyond what is “sustainable”. Therefore, it is bad. We need more cold and wet weather to destroy crops, promote diseases, and kill the excess living things. Last year (2010), about every other day the only reason to get warm temps was caused by El Nino. This year it’s La Nina, so let’s compare with the last La Nina. That is January 2008 with a similar La Nina amplitude (1.4). This is like comparing apple with apple. Go ahead, do it. Go to Spencer’s blog to do it the right way. You’ll end up with an inconveniant result where Jan 2011 is slightly warmer than Jan 2008 (both years with similar La Nina conditions). Have i seen a warming trend out of those two moments in time.. Absolutly not. It is call cherry picking on weather data and make believe it is climate. Tell me where’s the climate trend in this article. People are mixing/confusing there backyard weather with climate. This is like using the bottom of the curve(the low) sea level between two peek periods to claim the sea level is getting low. Even if this new low is higher from all the previous. Five bucks says all those alarmists cheering wildly for 2010 as being the hottest year since the Age of dinosaurs, will be deafeningly quiet as the substantially cooler temperatures of 2011 unfold. At least, that is – as someone said earlier – GISS manipulates/strangles the temperature data yet again to ‘prove’ something different. Umm, I don’t understand what the point here is for singling out one day (or month). Are you rooting for global temperatures to get lower on a day-by-day basis? Look at the entire graph and see that a good chunk of 2010 was near the record high trace line. Is this posting making some statement that global warming is going away? It would be some extreme cherry picking if that is the case. If so, why look at such a short time scale? Why not do a comparison to an average earlier than 2002? Oh, and it would be nice if this blog labeled the figures presented, such that people could refer to them as “Figure 1” or “Figure 2”, etc. You really need to understand Maths a lot better than this before attempting such a witless argument. A long-term average may hide huge variability, but that is no argument in itself to ignore the meaning of an average. Many salespeople are paid by commission, so their pay therefore can fluctuate wildly. But it would be daft to assert that one guy paid an average of $6,000 a month is not better than one paid $4,000 average a month on the basis that variations mean the worse salesman is paid more in some months. For three months data that might be true, for several years it would be unlikely in the extreme. That’s precisely why we invented averages! To smooth out the fluctuations. We have statistical tests that calculate the validity of averages, and you might need to do some reading to learn about them. Thanks for lengthy reply to Dr. Lurtz and thanks to Dr. Lurtz for the question. Thanks to this website, as well as yours and others, I understand the basics of station siting problems; station drop-out; historical temperature record adjustments; UHI; tree rings; problems with the SST depending on whether or not an insulated bucket was used when obtaining a measurement, as well as an untold number of other problems with the temperature record. After reading your post and working through some of the items (intensive and extensive properties), I can say it is the first time I’ve grasped that the concept of a global average temperature is meaningless, and by extension, so is a USA average temperature. It’s just bad science and the fact that it keeps, and probably will keep, getting published puts everything in a different perspective. Some of us are a little slower than others, but eventually it sinks in. Well said. And the remainder of your post is well-argued. The postulate of a “Global Average Temperature” is holding back climate science. And recall the 6-month lag. We’ll probably be down in that range for another 6 months. Come on, isn’t it obvious? You yourself point out the 2010 ‘temperature’, that’s cherry picking. The point is only that this is a deviation from the long AGW drama. Why isn’t the media reporting this when every ‘warm’ event is? Look at the ippc temperature projections. Do you see anything like this? It’s not supposed to happen. The comparison is for the period for which they have data. The volcanic ash has and is still exerting heavy influences on agriculture and daily life in the surroundings, though its influence on the global temperarute may be miniscule. The fundamental problem with your assessment, Mooloo, is that playing at averages can smooth things enough to render them meaningless. It’s pretty clear that the cause of the variations isn’t understood well enough to effectively quantify what the temperature would be without CO2. What good does the average do you then? Especially when you have those who say the warming can only be explained by CO2, because natural variations don’t explain it. Well, since natural variations fluctuate from month to month on a greater scale than the ‘unexplained’ signal, how in the hell can you say you even have a signal, and not a product of faulty application of statistics? For those asserting January satellite temps not being “low” enough, I’d like to make an observation that an enormous amount of heat was released during this Modoki El Nino early last year, and it doesn’t disappear immediately. Look at the UAH tropical LT where most of the heat originates on the planet. Compare December 2010 to December 1998, particularly over the oceans. I think we have yet to see the drop that is to come, globally. Also, there must be some effect from having so much of the surface covered by snow reflecting the heat right back up to the atmosphere. That may be what is happening currently with the LT behavior. Let’s see what it is in 3-6 months. One wonders if they (and other pro-AGW commentators here who have picked up the BoM’s comments and run with them) will retract that stement should the temps fail to reach the predicted leve-…. sorry I couldn’t finish that sentence without laughing. Thanks, E M Smith, for your lucid post. I have never bought the concept of global temperature as currently used for the reasons you explained so well, except where the temperature changes are very large – obviously, in an Ice Age the g.t. measurements would produce lower results than we get currently. When we are talking about fractions of a degree, or even 1 or 2 degrees, it is just meaningless. Nevertheless, it is a step along the way to developing better concepts and measuring techniques for both weather and climate. I just wish people would stop calling a lump of coal a diamond. We have a long way to go yet. As was pointed out before, this is almost exactly between 2008 and 2009. However it only covers 25/31 or 81% of the month. 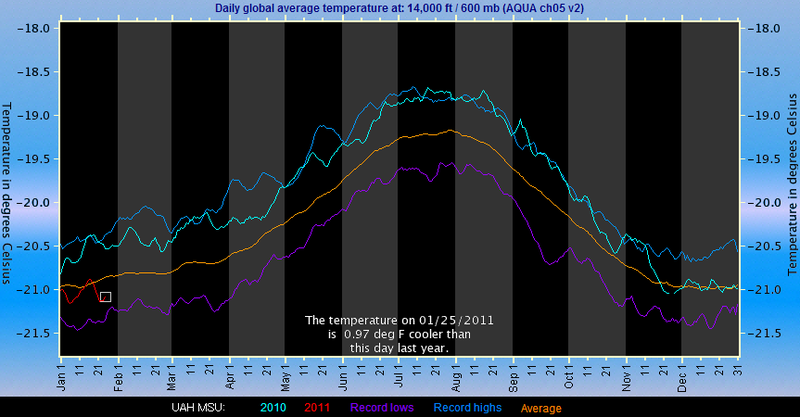 The anomaly in January 2008 was -0.30 and for January 2009 it was +0.15. This averages to -0.075. So with 6 days left, I will guess between -0.05 and -0.10. The warmest ever cold winter snowfalls. Right. Let them keep on shooting themselves in the feet with those ridiculous statements, their credibility ratings go right out the window with the icy bathwater. Last January anomaly was high from El Nino but it was claimed it was from global warming. This January anomaly is low because of La Nina. And La Nina as natural variation is used as the reason how global warming can still be happening while cooling also is happening. They are not consistent in using natural variation as the reason for temperature changes. If La Nina is natural so is El Nino. So the warm anomaly last January was not global warming but it was natural. Thanks for that masterful explanation. Anthony, how about promoting this to a complete post? On the first part of your comment i totally agree – such short period has absolutly no meaning climate wise – be it cold or warm. On the second part of your comment, you don’t know what you’re talking about. Try to get a snow storm raging at -30 or lower degrees, and you’ll have to wait a couple of month or years. It’s not GW related.. The more cold temps you get the harder it gets to have enought humidity (even of the sea coast) to get a single cloud. Definitly over those very frigid and cold area, a warmer temps (not by very much higher) means more snow and usually a lot of snow in such conditions. Elsewhere, higher temps means less snow and more drizzle or pellets/wet snow/freezing rain, if not rain instead of wintry precipitation. I’m glad that this January is looking cooler. We certainly don’t need a repeat of 2010. I would be not as nice as Joe, and say it more bluntly: “two-thirds of the globe’s stations were intentionally dropped out in 1990″. The statue of ‘The Thinker’ reminds me of E.M Smith. Thanks for your insights, Chiefio. Imagine taking the temperature of any ordinary human being on the planet by meausring the temperature at a million points on the surface and averaging. Wonder what the NEW Normal would be? For 2000 to 2010, I eliminated Amundsen, because it was too far. For that decade, I now get 18°C. This is the reductio ad absurdum for the result of “climate scientists” eliminating the number of monitoring stations from about 400 to 100 in the last 30 years, and shows how averages can be skewed. Your example is not valid for many reasons. The main one being that the measure of temperature change is given by anomalies. In your example, the ‘global’ anomaly would be related to the temperature change at the 4 remaining stations. Looking at all the trend charts since 1980, the temperature drop is not particularly unusual, and does not look significant. What I was pointing out with the remark that 2010 is near the record high line much of the year is that it seems strange to claim we are 1 deg Farenheit lower than this time in 2010 since last year was also near the record high line at this time (why not compare to the average?). I wasn’t cherry picking trying to claim that a single year represents an accurate picture of the climate trends, but when someone says that a day (or a month) that deviates from the upward temperature trend should be pointed out as something indicative of a change in the trend, that is cherry picking. It just seems a bit biased to say that a single data point that deviates from the “AGW drama” should be covered, even though the overall decadal trend is upward. And that’s a valid gripe. I get that the UAH dataset goes back that far, but we can still look at the established data for earlier times to get an idea of the climate trend. To focus on such a small sliver in time, as this article does, we can’t draw any conclusion that there is a truly meaningful deviation from AGW. Hold your horses. First, you have to show that AGW actually exists. To show that you need measurable, quantifiable, testable evidence. But so far, AGW is too insignificant to measure. “Hold your horses. First, you have to show that AGW actually exists. To show that you need measurable, quantifiable, testable evidence. You state that AGW is too insignificant to measure, but what measurements are you referring to? Regardless, your point is taken that one can’t assume there is a trend without evidence. I was basing my comment on AGW from the assessments of groups such as the National Academy of Sciences and others that have affirmed graphs that show a distinct warming trend following the Industrial Revolution. But putting the AGW trend issue aside, my point still stands that it is somewhat strange to show a cool day or month if talking about climate. The article may just be showing the global temps as compared to last year, without any comment on climate. That’s fine, I suppose. These longer-term sets of data lend credence to an upward trend. Plus, the troposphere warming while the stratosphere cools suggests that something is acting like a blanket within the troposphere. One day or month’s temperature doesn’t say much, but a decadal trend does. I would agree that you can’t judge much based on a 1-2 month trend. And, this is considered a La Niña Ocean Current year/season which tends to show lower ocean surface temperatures (with presumably higher subsurface temperatures). There also has been no significant “warming” since 1998.
here is a chart I cut out of one of the recent NOAA graphs. I’ve drawn a line at about 0.58 °C. 1998, 2002, 2003, 2004, 2005, 2006, 2007, 2009, and 2010. 1999, 2000, 2001, and 2008 fall below the value. Of course we are still early in 2011, but some of the trends resemble 2008, so another year below the 0.58°C would not be unexpected. The same thing goes for the Wikipedia graphs above. You could easily draw a straight line (or perhaps even a downward trending line) from 1998 to present. The sea surface temperatures have been dropping since early 2010. One of the problems with most of the graphs is that they tend to ignore the warming around 1940. NOAA uses a 1961-1990 base period, with about 1960 beginning a significant cooling trend with respect to many of the weather stations, especially many of the arctic weather stations that now appear as red blotches on the maps. Look at Jan Mayen Island, for example. If you chose your mean from 1921 to 1960, then you would only see a slight warming in the last couple of years, and attribute it to a statistical anomaly. There are some estimates that we are now beginning one of the weakest solar cycles in a century. We have yet to see the influences of the weak solar cycle on the climate. However, either no additional warming, or perhaps a cooling trend for the next decade would not be unexpected. The implications of such a trend have yet to be seen. And, it is still possible that temperatures could bounce back with a vengeance in the future, but hopefully at that time we’ll at least have good baseline temperature records for comparison.